EQ is an acronym that stands for emotional quotient and is used to describe a person’s emotional intelligence. More specifically, EQ is used to measure a person’s ability to identify, control, and express emotions. IQ, on the other hand, stands for intelligence quotient and is used to measure a person’s intelligence. A person’s IQ describes how well he or she can learn, understand new concepts, comprehend words, solve problems, and apply skills in the real world. Being intelligent is important, but many experts believe that having a high EQ is more important than having a high IQ. It is believed that people with a high EQ are better equipped to be leaders in their professional lives. Emotionally intelligent leaders can identify with their teams, recognize their strengths and weaknesses, and motivate them by appealing to their emotions. People with high EQs also have more successful personal relationships according to experts. These individuals show more compassion and empathy towards others, are better communicators, and know how to control their own emotions. These are all traits that can be used to strengthen personal relationships and connect with others. Teachers often focus on raising their students’ IQs by teaching them new skills, but an increasing number of schools are starting to recognize the importance of teaching EQ, too. Children improve their emotional intelligence through a process known as Social and Emotional Learning (SEL). When this process is incorporated into the classroom, kids can improve both their IQs and EQs and become more well-rounded, adjusted children. 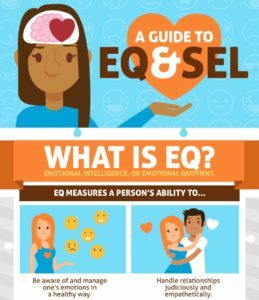 To learn more about EQ and SEL methods, take a look at this helpful infographic.